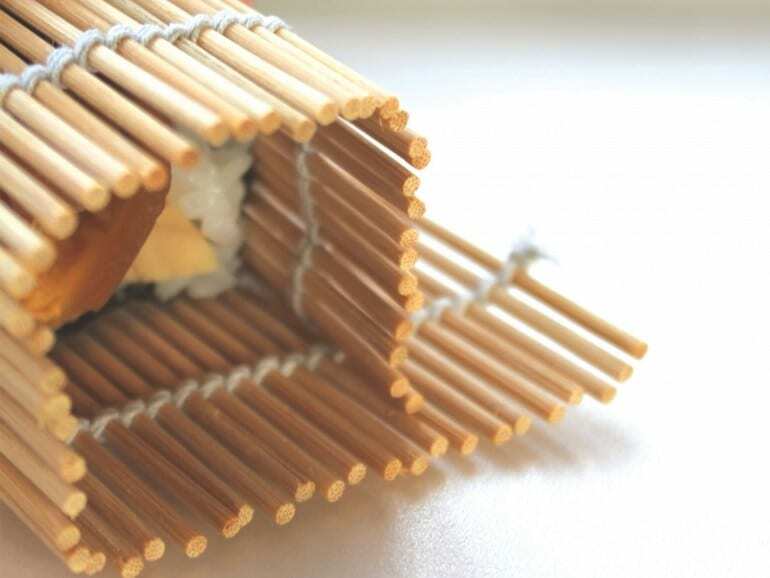 You’ve seen chefs expertly prepare sushi rolls using makisu. You’ve probably even tried your hand at using the mat yourself. Find out more about this traditional utensil that helps create one of Japanfs quintessential dishes. The art of sushi-making in Japan is a time-honoured tradition that is believed to have its origins in the 8th century. Suffice it to say, the utensils used to prepare the sushi are also heavily steeped in national pride. One of them is the ubiquitous and indispensable makisu, the bamboo mat thatfs used to make sushi rolls. If you have tried using makisu before, you would definitely agree that it isnft as easy to roll as how sushi chefs make it out to be – more often than not, the final product ends up falling apart during the first few attempts! From the even spread of the sticky rice to the actual rolling of the mat, it involves a certain kind of momentum and flow that can only be achieved with years of practice. Woven from thin bamboo strips and cotton string, makisu are generally square and similar in size (25cm x 25cm). The two common variations available differ in the width – one contains thinner bamboo slats; the other, which is touted as the more versatile choice in the Japanese kitchen, contains thicker slats. A less conventional form of makisu is made out of silicone instead of bamboo. Because of its nonstick surface, silicone makisu is easier to clean, as well as more hygienic and durable – and it also comes with a higher price tag, too. Makisu can be used to roll and shape many types of cylindrical sushi rolls, including makizushi (wrapped in nori, or seaweed) and uramaki (rice on the outside, nori on the inside). For the latter, sushi chefs would typically cling-wrap the makisu so as to prevent the rice from sticking to the grooves of the mat. The cling wrap also serves to facilitate the cleaning process. Besides rolling sushi, makisu are also used to shape malleable foods like tamagoyaki (Japanese omelette), and to drain excess liquid from moist food items like vegetables. One important point to note is that makisu should never be placed in the dishwasher. Instead, wash it by hand and use a small brush to remove any rice that is caught between the grooves. Also, be sure to thoroughly dry the makisu before you store it away to keep bacteria at bay. Makisu are readily available at supermarkets and specialty stores. But if youfre into DIY handicraft, we chanced upon a video that shows you how to create your own makisu using household items – and it works! Cut the skewers into 18cm-long sticks, removing the pointy end. Cut two pieces of duct tape, each measuring 22cm long. Lay one piece of duct tape on the table, sticky side up (you might want to use a double-sided tape to secure the duct tape to the table). Leaving about 2cm from the two ends of the duct tape, place the skewers in between, one at a time. Turn the mat over, and paste the second piece of duct tape over the bottom half of the skewers, leaving 5cm in between the two tapes. Cut two more pieces of duct tape and stick them to the back of the mat, directly over the first two pieces. Fold, roll, and move the mat to loosen up any rigidity between the skewers.